Magnolias are a genus of about 100 species of flowering trees, ranging from 10-foot dwarf species to soaring 100-foot trees. Whichever type you grow, the tree will benefit from rich acidic soil and protection of its roots. Since the magnolia's surface roots are sensitive to disturbance, they are a good candidate for containers, provided they receive proper care. The flowers of the species vary in color and appearance but are usually fragrant. Proper care of a container-grown tree requires special consideration of water and nutrients. Select a pot that can sufficiently contain the roots of the tree, allowing them some extra space. Consider the ultimate height of your magnolia. Sweetbay magnolia can reach 30 feet, while the southern magnolia can reach 80 feet. To reach their full size and maximum life span, small trees need a planter with 4 feet by 4 feet by 4 feet (64 cubic feet) of space, but they can be restricted to a shorter height with proper care. Provide rich, well-draining potting soil that is slightly acidic. It should have adequate water-holding capacity and provide sufficient nutrients for the tree to grow. Amend with compost to add some nutrients to the soil. An Azalea and Camellia potting mix, which is acidic, is ideal for growing magnolias. Place the tree in a protected, sunny location. Partial shade is also appropriate, especially in hot climates. 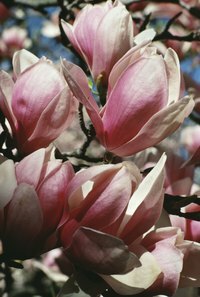 Fertilize at least once a year, using a slow-release acidic or magnolia tree fertilizer. Protect roots from winter cold by placing the tree in a location that is shielded from wind and chill. If necessary, insulate the pots with tree wrap. Larger pots with more soil tend to protect trees better from cold because of the insulating qualities of soil. Prune the canopy with tree shears to control its spread and growth. You might also cut the roots back to 1/3 of their length. Known as root pruning, this is a common method for controlling the size of container-grown trees. Transplant to a large container once the roots become pot-bound. If left constricted, the tree might be severely damaged. Root pruning is beneficial and could boost growth if done before transplanting. Some of the best magnolia species for growing in pots are southern magnolia, Ann magnolia, Galaxy magnolia, saucer magnolia and star magnolia. Magnolia roots are susceptible to freezing during winter and suffering from dry heat during summer as a result of being exposed above ground. Well-insulated pots and careful attention to extreme weather conditions are necessary to avert these problems. What Does Magnolia Smell Like?